The Coincidence of Callie & Kayden (The Coincidence #1) is a new adult story by Jessica Sorensen. I normally only read books in English, but I saw the Dutch translation and it wasn’t expensive and the story sounded good, so I bought a copy; I read this book in Dutch (that’s why I chose a picture of the Dutch cover). But now I know I probably won’t buy a Dutch translation again soon. I’ve read a few books about two characters who’ve been abused in their past, meet each other and fall in love. Some people say that is a reason to not love a book. I don’t really mind I’ve read about a topic before, as long as the author brings me new characters and a believable, readable story that will hold my attention. And I think Jessica Sorenson managed that. 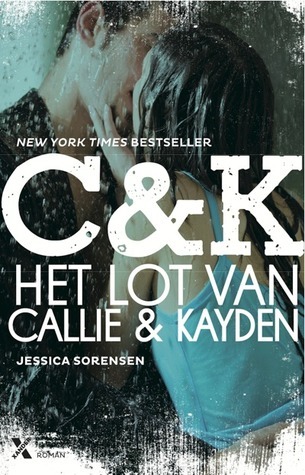 I found myself in Callie and Kaydens world just a few pages into the story. I love how I found out more about what happened to them, Callie especially, throughout the story. As though the better I got to know her, the more she trusted me,the more she told me. The thing dat did annoy me in this book, I think that has to do with the fact that I read the Dutch translation. Especially on the first hundred pages or so, the way Callie and Kayden spoke or thought, was not believable. They used old-fashioned, even leaning towards formal at times, language. There were even a few words I did not know. So that’s a no for believable and realistic conversation between two eighteen-year-olds. Don’t get me wrong, I don’t mind it when there’s, how can I explain, more difficult/not everyday used words in a story. To bring the story to a new level, to really illustrate a characters personality, but they have to fit into the story. And in this book, I felt they did not fit. It got a bit better at the end of the story, but still – the weird choice of words made it hard for me to just read and not think about the choice of words I’m reading. I don’t want to analyse the words, I just want to be swept away into another world. I think it was the translation that let me down because I’ve read a few other books by Jessica Sorensen in English and I don’t recall the characters in the other books speaking that way. Then, there is the possibility of the author letting them speak that way on purpose. So there was one thing left I could do, besides read the original story. Contact the author. And so I did. But I haven’t received an answer (yet). But as I already said: I think it is the translation and not the story.